Bamboo thresholds are often used to transition from a bamboo floor down to a lower or higher floor like carpet, tile, or at a front door or sliding glass door. Since the bottom of the threshold is usually "ripped" (cut) to match the lower floor's height, this molding can really be used to transition between any two floors of unequal height. 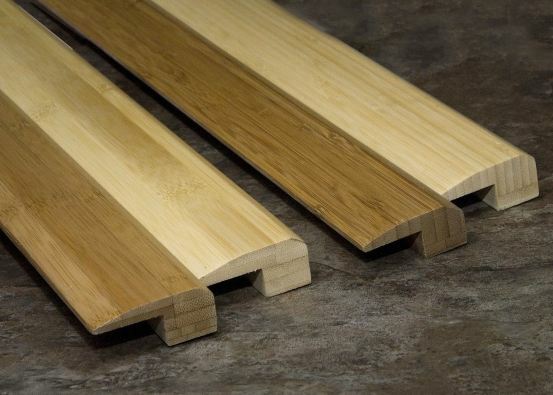 You can shop all of our bamboo thresholds on our molding & trim category page. Both functional and stylish, bamboo thresholds can also be used to add a sense of boundary to an open-concept room or as an accent for design purposes. We offer a variety of color and material options so you enjoy the perfect match. Best of all, our bamboo overlap thresholds are built to last and, with just a minimal amount of maintenance, will give you years of trouble-free use. Our overlap floor thresholds are available in classic and strand-woven bamboo. Classic bamboo is an economical choice that combines superior strength and durability with the unique look and feel of real bamboo. Strand-woven bamboo, our premium option, is specially formed to be three times as dense as oak, providing the ultimate in strength while mimicking the grain of traditional hardwoods. Both options are available in natural (blonde) and carbonized (tan) and many other colors. Upgrading to our strand-woven overlap bamboo thresholds gets you several additional color options, including tiger, chocolate, sangria, sienna, cinnamon, honey and cider among others. With flooring sample kits available free of charge - we'll even cover the shipping for the samples - choosing the right color is fun and easy! 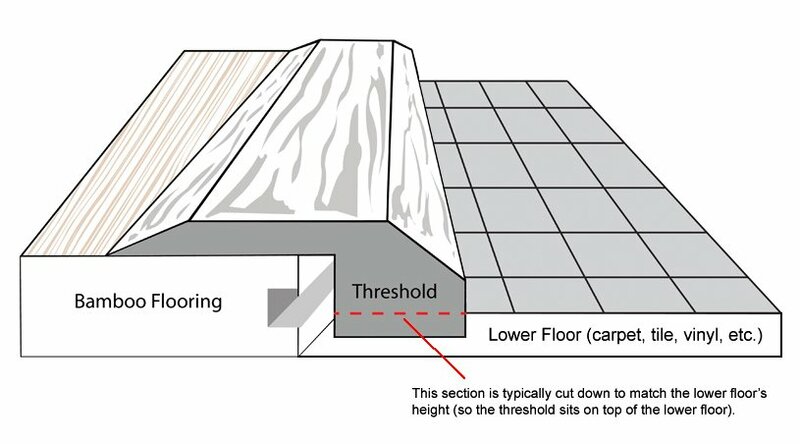 There's no trick to installing our bamboo overlap thresholds. Simply use liquid nails or another non-water-based adhesive to hold the molding in place, weigh it down with a heavy object and allow the glue to set. There are no special materials or skills required! Maintaining our bamboo floor moldings is simple - built to last and finished with our exclusive AccuSeal® System, our products require no special upkeep - simply buff out scuffs and stains with a damp rag. You can also use any approved hardwood floor cleaner or a natural cleaner such as white vinegar. Because certain cleansers may react differently, we recommend you test a new product on a hidden patch of floor or spare plank before proceeding. With Ambient Bamboo Floors, there's no trick to keeping your floor looking its best. Contact us today to for a free quote!